Bee Removal is a special service offered by many wildlife removal company's. we provide expert Bee Removal Services throughout the US. Many wildlife removal specializes in nuisance pest control and wildlife management which includes the removal of Bees, Wasps, Honey Bees, Hornets and all other stinging insects that are found in the US. Bees are dependent on pollen as a protein source and on flower nectar or oils as an energy source. Adult females collect pollen primarily to feed their larvae. The pollen they inevitably lose in going from flower to flower is important to plants because some pollen lands on the pistils (reproductive structures) of other flowers of the same species, resulting in cross-pollination. Bees are, in fact, the most important pollinating insects, and their interdependence with plants makes them an excellent example of the type of symbiosis known as mutualism, an association between unlike organisms that is beneficial to both parties. The most commonly seen bees are honey bees and Bumble bees. However the pests that we all know and fear as bees, are in fact not bees at all, they are Wasps. What ever type of bee or wasp problem you have, be sure to call a Licensed professional to help you solve all your bee and wasp problems. these are very aggressive stinging insects that can cause injury when when a improperly equipped person tries to control them, some bees and wasps nest size can exceed 15000 bees. this is a lot of bees to try to fight with a can of Raid. Call a professional today! Honey Bee, common name for any of several species of highly social bees known for their honey-hoarding behavior and their use as a domesticated species. The European honey bee is important in modern agriculture and in nature, providing pollination for many valuable crops and wild plants. It is native to Asia and the Middle East and was introduced to North America by early European colonists. By the mid-1800s honey bees had become widespread. Today, they are naturalized on every continent except Antarctica. Honey bees can be easily reared, are adaptable to many climates and to laboratory conditions, and have a complex social life. They are among the most studied and best known insects. In addition to the familiar European Honey Bee, there are six other recognized species of honey bees, including the Indian honey bee, koschevnikov's honey bee, the dwarf honey bee, the andreniform dwarf honey bee, the giant honey bee, and the mountain giant honey bee. The European, the Indian, and to some extent the dwarf honey bees are the species that have been domesticated, although the European honey bee is by far the most widespread domesticated bee and the only species kept in North America. There are many races of the European honey bee. The ones most popular in modern beekeeping are the Italian, Carniolan, and Caucasian. Most honey bees used in hives today are mixtures of these and sometimes other races. Africanized honey bees, also known as killer bees, are a hybrid of African and European races naturalized in the western hemisphere. The honey bee community consists of three structurally different forms-the queen (reproductive female), the drone (male), and the worker (non-reproductive female). These castes are associated with different functions in the colony; each caste possesses its own special instincts geared to the needs of the colony. Anatomically, the queen is strikingly different from the drones and workers. Her body is long, with a much larger abdomen than a worker bee. Her mandibles, or jaws, contain sharp cutting teeth, whereas her offspring have toothless jaws. The queen has a curved, smooth stinger that she can use repeatedly without endangering her own life. In contrast, the worker honey bees are armed with straight, barbed stingers, so that when a worker stings, the barbed, needle-sharp organ remains firmly anchored in the flesh of its victim. In trying to withdraw the stinger, the bee tears its internal organs and dies shortly thereafter. The queen bee lacks the working tools possessed by worker bees, such as pollen baskets, beeswax-secreting glands, and a well-developed honey sac. Her larval food consists almost entirely of a secretion called royal jelly that is produced by worker bees. The average lifespan of the queen is one to three years. As with all bees, pollen is the principal source of protein, fat, minerals, and vitamins, the food elements essential for the growth and development of larvae of all three castes. Adult bees can subsist on honey or sugar, a pure carbohydrate diet. Besides gathering and storing food for all the members of the colony, the workers are responsible for maintaining the brood at 33.9? C (93? F), the optimum temperature required for hatching the eggs and rearing the young. When the nest or hive becomes too hot the workers collectively ventilate it by fanning their wings. During cool weather, they cluster tightly about the nursery and generate heat. The eggs, which are laid one per cell, hatch in three days. The larvae are fed royal jelly for at least two days and then pollen and nectar or honey. Each of the hundreds of larvae in a nest or hive must be fed many times a day. 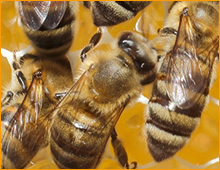 For the first three weeks of their adult lives, the workers confine their labors to building the honeycomb, cleaning and polishing the cells, feeding the young and the queen, controlling the temperature, evaporating the water from the nectar until it thickens as honey, and many other miscellaneous tasks. At the end of this period, they function as field bees and defenders of the colony. The workers that develop early in the season live extremely busy lives, which, from egg to death, last about six weeks. Worker bees reared late in the fall usually live until spring, since they have little to do in the winter except eat and keep warm. Unlike other species of bees, honey bees do not hibernate; the colony survives the winter as a group of active adult bees. Our services include all wildlife management, Bee Control, Bee Removal, Honey Comb Removal and all stinging insects control, we also provide services such as animal control, animal removal, cleaning and repairs of residential, industrial, and commercial properties. we also handle the removal and control of animals in all areas, please visit our wildlife removal professional page to find a bee removal professional in your local area.